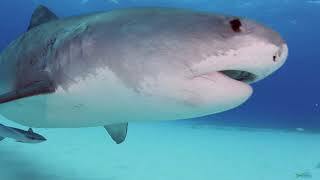 Massive Mako Shark Surprises Diver and Blue Marlin! While on a Guy Harvey Expedition off Cat Island in the Bahamas, diver and shark expert Jim Abernethy was filming a blue marlin underwater when he got a surprise visit from a 10ft. long, 600 lb. mako. Out of nowhere, the massive shark shoots past Jim like a missile, passing within feet of the unsuspecting diver and turning a quiet, peaceful dive into an explosion of bubbles and shouts!